Come and spend a day of happy memories of your travels or bring your dreams to life in a journal which you can add to over the times. Clare will show you easy ways to record and make notes to create a visual diary or sketchbook which you can add to on holiday, day trips or even just a walk. She will demonstrate how she keeps her travel sketchbooks and show you how to do the same. They are a wonderful preserver of memories and often can lead to further paintings. An opportunity for you to come along and work on your own art in a sketchbook or paper / canvas / textile with friendly like minded souls. Great networking and community feel. £5 including tea / coffee / biscuits. Experimental Landscapes- A Weekend of learning new techniques All materials included. This is a day workshop creating Spring Flowers of your choice; Hellebores, Pansies, Daffodils, Tulips or Snowdrops. A lovely workshop & a creative day for yourself. All materials are included in the price. Refreshments will be provided. Lunch is available to purchase at the cafe onsite or bring a packed lunch. A day to learn techniques in oil paint. £32 (or £37 if you are a beginner and need to borrow materials). Take part in a fun printmaking day creating hand printed lino prints inspired by Mexican masks and patterns. All the fun of a fiesta! You can use either traditional lino or Soft Cut vinyl which is softer to cut into. We are using water washable non-toxic inks but some colours may stain, so wear old clothes and/or bring an apron. Please bring any photos or sketches on a Mexican theme that you may have and there will also be some Mexican masks and patterns to inspire you. You will have the opportunity to learn in more depth the art of Nuno Felting & create a silk scarf. All material will be provided including the silk scarf which you will use to turn into a scarf which will be a wearable work of art! A lovely day of self nourishment in creative company. To book please contact kanjana.nicholas@blueyonder.co.uk or go direct to Eventbrite (small booking fee). You are invited to take part in a fun day creating prints and writing tiny poems (Haikus) inspired by a Japanese theme. Well-known award-winning writer and poet, Emma Purshouse (http://www.emmapurshouse.co.uk/), will show you how easy it is to write 3-line haiku poems and you can write one or two yourself, if you wish! Linda will guide you to make relief prints. Full details and booking through Eventbrite. Make some prints and write a tiny poem (Haiku) with a Japanese theme! Linda Nevill, Fine Art printmaker/painter (recently elected as an Associate Member of the Royal Birmingham Society of Artists – www.lindanevill.com) ) will help you to create relief prints based on a Japanese theme. A choice of materials will be available including traditional lino, soft cut vinyl, polystyrene sheets and also tissue paper. We are using water washable non-toxic inks but some colours may stain, so wear old clothes and/or bring an apron. £35 all materials provided. Age 16+ No previous knowledge of printmaking or haiku writing required. Beginners welcome. Please bring any sketches or photos you may have on a Japanese theme and there will also be some reference materials available to inspire you. Ever wanted to unleash your inner Bridget Rileyor Pablo Picasso? This fun, one day course will give you ideas forcreating an abstract painting. 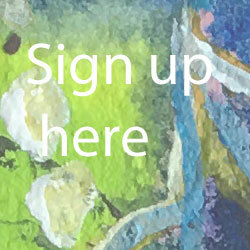 With the emphasis on developing your own style,we’ll be looking at how simplifying forms, exploring scale and perspective, andusing colour, texture and mark making will unlock your imagination to producedynamic paintings.